WW1 Reenactments Equipment : Great War Tommy WW1 Food Rations Labels : Colonial brand Condensed Milk label, 1901. 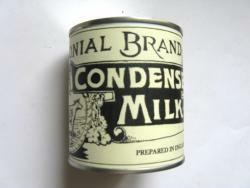 WW1 Reproductions and WW1 Reenactors Equipment / Kit - Colonial brand Condensed Milk label, 1901. "Colonial" brand Condensed Milk label, 1901. "Colonial" brand Condensed Milk label by G.E.N. (?) Produced in Holland. Fits current Condensed Milk cans.